thanks… I actually busted out a pair of “maternity” scrub pants this week that a friend gave me. Who knew you could take the most relaxed and comfy work attire and make it even more elastic?!? I CAN NOT wait until you hatch that little chicken… I so want to know if it’s boy or girl (I’m on team boy)… love your blog! Those scrubs are adorable! I think you’re right about the old people. They do love it. It took a lot of that before I, myself, realized how special it is to have a bay ….to everyone else. Of course it’s special to you, but it’s nice to know that strangers are happy for you too. Glad everything is going well! And congrats to your bud! I don’t know if any scrubs can be classified as “adorable” – but these are fun ones 🙂 I agree, and think that most of the time we are so focused on being pregnant and the baby that we forget we are contributing to society, and society wants to participate too! hope all is well with you and your little guy! You look adorable pregnant! 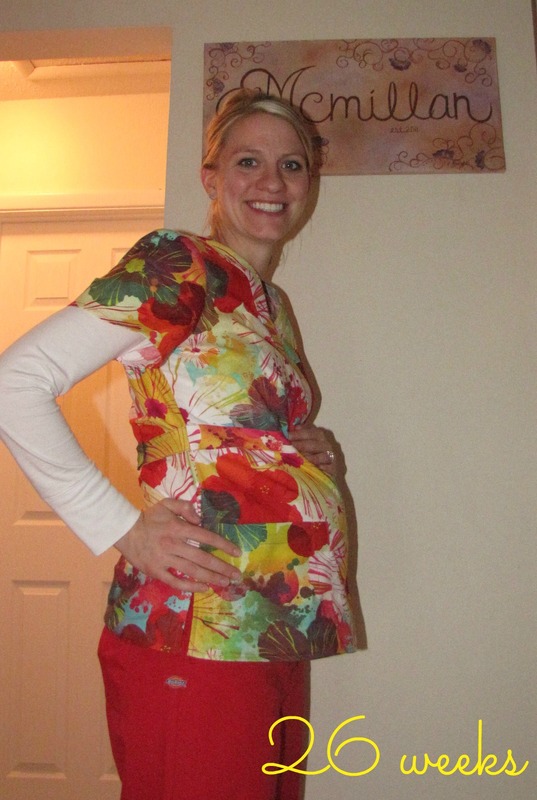 Your patients sound so cute and I think it’s awesome that your pregnancy brings out a spark of joy in them! My mom is a nurse so I also have a special love for nurses too 🙂 great post! old person patients are pretty cute, and probably equally as awkward as middle school kids are 🙂 and you look adorable too… running out of room yet? I can’t imagine two babies fighting for space in my belly! hope you’re feeling good! I’m still waiting for the 1st stranger to rub my belly! I don’t know why no one has done this yet. I’m not one to be bothered by that sort of thing, so I’m actually a little bummed it hasn’t happened and wondering if it ever will. If a little 90-year-old woman gave my baby a little love that would absolutely put the biggest smile on my face. Hehe, it was so cute when the little lady asked me point blank. Most find a round-a-bout way to bring it up. And I’m the same way, i really don’t care you gives the belly a rub, Lord knows I do it all the time to other pregnant ladies! thanks! how’s life with the baby girl?? back to work yet?? You make me want to be pregnant again….right now! Looking good and will definitely pray for your friend. I keep our Christmas cards out and then every night Drake and I (OK really only me) pray for that family we received the card from. Saw the McMillan family is next in the rotation for tonight! Awe, thanks! I wish I would have gotten to see more of you pregnant with Drake!! I am sure you were adorable!! How far along were you when you did maternity photos?? I think we’re going to do some at 30 weeks. And, thanks for the prayers, all are appreciated! Miss you! Yes do pictures at 30 weeks…before you may possibly swell like I did 🙂 You don’t care to remember that time.